This entry was posted on February 21, 2011 at 4:09 pm and is filed under Barack Obama, Conservative Issues, Democrats, first Jeremiah Wright term, Politics, socialism. You can follow any responses to this entry through the RSS 2.0 feed. You can skip to the end and leave a response. Pinging is currently not allowed. Great post. That is one strong looking dog! Your exhortations to the R’s in power sound eerily like statements my husband makes. We either fight to win against these evil Dem thugs or we and our descendants are toast. He looks awesome !! I put my guy to sleep about 7 years ago and he was about the same size. His name was appropriately “Titus” and I found it in the Bible. His parents and genealogy had many Shuzhund I, II, & III (can’t remember the correct spelling, sorry) and he weighed in at 165lbs shortly after his 3rd birthday. The trainer always said that he was abnormally large both in height and weight for a male Rot but I loved him that way and people would step off the sidewalk when I walked him. It made me smile as they had no idea he would slobber them to death if I let him now it was ok. I remember the first training session I took him to as all of us Rot owners stood in a circle and the trainer agitated them by whipping in a circle some sort of stuffed cylinder on a rope. My guy wasn’t interested and we were kind of disappointed that he had little interest in the guy dressed up in the protective attack armor. That changed after two sessions of teasing him when he took down the trainer in his suit, ripped off his hand/arm protection and returned to almost take a couple fingers with it. I was asked politely to never return as his size was unmanageable. I laughed the whole way home. He never attacked a single person and played gently with all my nieces and nephews as if they were made of glass. It still amazes me to this day how gentle he was and yet so forceful when it was needed. I haven’t been able to bring myself to get another as the pain of letting him go still hurts and that says a lot as I am not what people would describe as a sensitive man. They are the “original dog” and upon investigation I learned they were used to guard the Roman Army encampments, true warriors !!! Enjoy your guy, he looks awesome !!! This might be the Republicans LAST chance to prove that they have answers. And since the problems are almost entirely caused by Democrats (including the 2008 mortgage market collapse; see “Fannie and Freddie”), the solultion is for Republicans to stand dead set against them. Republicans either stand firm against these un-American government unions, or they should just fade away with all the other Dodo birds. We have the arguments against these government unions on our side. FDR HIMSELF gave them to us. It’s time for the GOP to stand up and fight, because this is a hill we cannot lose. Like I said, my breeder likes big Rotts. She had three males, one AKC perfect, one huge. I took the middle-sized one – who the breeder said was 145lbs and just looked TOUGH – and got a dog bigger than the giant sire she had. Of course, you can breed chihuahuas to get big just by breeding only the biggest puppies, and so on. The one thing I have not liked about my big Rott is his aggression. He isn’t the face licker yours was (he licks OUR faces and that’s it). My dog went to obedience school when he was 6 months old. He was already the biggest dog in the class of about 25 students. At that point he wasn’t aggressive and did very well with other dogs. He placed 2nd in the graduation test. And the only reason he didn’t place FIRST was because most people clearly didn’t do their homework with their dogs, such that the trainer had to spend a lot of time in class correcting other people’s basic problems. We would be on sits that would just go on and on, and my dog would lie down. And I allowed that because I wanted to lie down, too. And at the final, there was a three minute sit. And my dog layed down after two minutes. Other than that, he had a perfect score. But at some point after that – and I don’t even know when – something just switched off in my dog. I think I’m the cause; because my work got crazy and I couldn’t properly socialize him to other dogs after that obedience class. And now, of course, only people who fight dogs would want my dog to meet theirs (and no, I would NEVER let any dog I owned intentionally fight). He now loves only the people that he knew as a puppy and will not bond with anyone else. My brothers, my parents, the next door neighbors and NOBODY ELSE are okay. He loves them. I had some close friends who were neighbors move out of state. They were away for a couple of years. They came to visit and the dog remembered them. Acted like a puppy and rolled over for a tummy scratch. But other than those few, this dog would kill a 109 year-old nun if she got too close to me. Just in playing with my Rott, big as he is, I know his power. If he were to go after somebody, there is not way he wouldn’t be able to get them on the ground. And once on the ground, a person would never get back up. I am VERY careful about this dog. He is dangerous to strangers and I know he’s dangerous. But I intend for him to live out his days. He protects my household from the world when we’re in private and I view it as my responsibility to protect him from the world when we’re in public. Which is to say, I don’t give him a chance to hurt someone. I built an iron fence on top of the existing stucco wall, and I am very careful and watchful about letting him off the leash (fortunately I live near a wide expanse of desert). And this dog has NEVER “run off” or “got away.” I recognize that protecting the public is my responsibility. 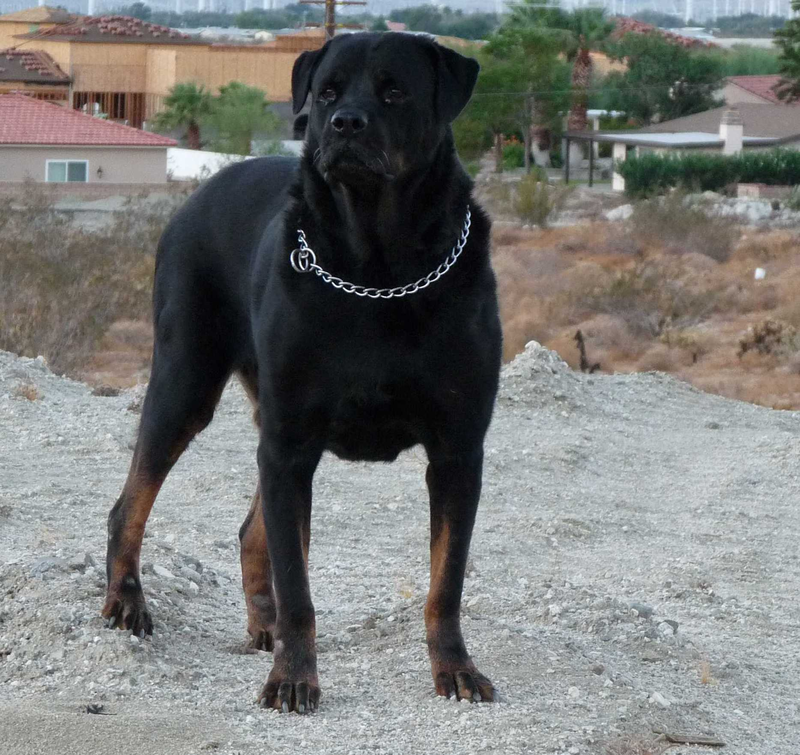 Rottweilers were around since ancient Roman times and are among the oldest breeds. I have always loved them simply because I love big, powerful, athletic dogs. You watch a Rottweiler run and move and it is a sight to behold. already seen it, but just in case you didn’t I’m linking to it here. Very moving story, HL. I hadn’t seen that, and thanks for showing me the link. I’ve seen that kind of devotion and, yes love, from dogs enough times to always want to have the presence of one in my own life.